Practice exams are aligned with the same Detailed Test Plan as the corresponding certification exams. They consist of the same number of questions from the same categories and provide up to three attempts for the user, measuring performance in each content category. This online practice exam is aligned with the same Detailed Test Plan as the certification exam. It consists of the same number of questions from the same categories and provides up to three attempts for the user. Interactive Review Systems provide candidates with a comprehensive review for certification exams. Each system is designed to review content, skills, and concepts previously learned through formal education or work experience. This Surgical Technology Review follows the TS-C (NCCT) Detailed Test Plan and provides a review of material related to Surgical Technology. This system provides a Practice Exam that simulates an actual certification examination experience, among its many other features. This Medical Assistant Review follows the NCMA Detailed Test Plan and provides a review of material related to Medical Assisting. This system provides a Practice Exam that simulates an actual certification examination experience, among its many other features. This Phlebotomy Technician Review follows the NCPT Detailed Test Plan and provides a review of material related to Phlebotomy. This system provides a Practice Exam that simulates an actual certification examination experience, among its many other features. This Insurance & Coding Review follows the NCICS Detailed Test Plan and provides a review of material related to Insurance & Coding. This system provides a Practice Exam that simulates an actual certification examination experience, among its many other features. Work your way through content categories using the Interactive Review. Question rationales, where appropriate, help you reason through why the best choice is correct and why the others are not. They provide mini-lessons on the subject matter. Each review system contains one full Practice Exam designed to simulate a certification examination experience. It consists of similar questions covering identical content areas administered within an equivalent timeframe. Practice your exam skills by taking this examination simulation! “Decks” of flashcards are categorized to help you memorize Abbreviations and Medical Terminology. Practice flashcard drills on a phone or tablet for easy on-the-go learning! Exercise your critical thinking skills using case scenarios. Simulated cases encourage you to think critically through a scenario to make decisions and solve problems. Open-ended questions allow you to submit self-directed responses, and suggested answers are displayed for quick comparison. Access the data as often as you would like! During the subscription period, you have unlimited access to all data. This includes immediate access to Flashcards, Case Scenarios, and Interactive Review questions. In addition, once you have completed the Preliminary Sample Quiz and one-time Practice Exam, those questions and rationales will also be available for unlimited access. For optimal system performance, use the most up to date web browser version with zoom set at 100%. Interactive review will not operate unless Cookies are enabled. System performance is dependent upon internet connectivity (bandwidth and speed) and device capability. NCCT makes no warranties or representations regarding the content, analytics, or results of this exam review system and practice exam, and disclaims all warranties of merchantability or fitness for a particular purpose. As a condition of accessing the review system and/or practice exam, I hereby waive any and all claims, actions, or demands and release NCCT, its officers, directors, shareholders, employees, and agents, from any and all claims, actions, demands, damages, or loss that may be suffered in any way and at any time. To preserve the integrity of the official certification examinations and to maintain our position as a reputable certifier, NCCT cannot and has not duplicated any official exam questions within these products. I am neither required to purchase and complete any of these products, nor does doing so guarantee that I shall pass the certification examination. The Practice Exam contained in the Review System is designed to simulate a certification examination experience. It consists of similar question formats covering identical content areas administered within an equivalent timeframe that will be scored and analyzed. Information generated in the Practice Exam Analysis aims to help exam candidates identify content areas upon which to focus study preparations. The Practice Exam in the Review System will be administered, scored and analyzed once per system purchased, with the questions, answers, and rationales remaining available for unlimited access throughout the subscription period. 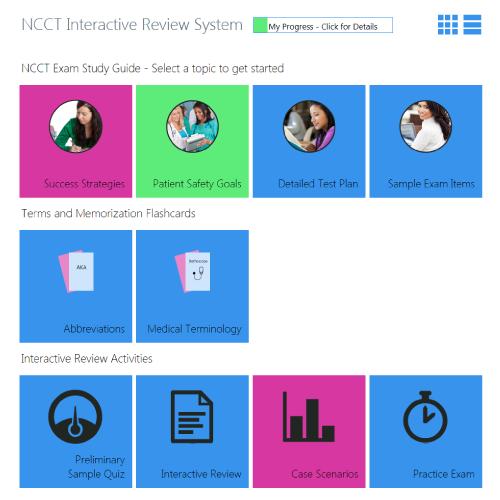 The Review System is designed to review key concepts matched to the content areas of the NCCT Certification Examination Detailed Test Plan. It is not designed as a primary instruction tool. The Detailed Test Plan is available to the public at no charge. NCCT makes no claims that completion of this review system guarantees a passing score on a certification examination. The Practice Exam stand-alone product consists of similar question formats covering identical content areas that will be scored and analyzed. Information generated in the Practice Exam Analysis aims to help exam candidates identify content areas upon which to focus study preparations. The Practice Exam will be administered, scored and analyzed up to three times per product purchased.